AEM derives the port number from the quickstart jar file. As the documentation says that by renaming the jar file, we can configure AEM to run on a different port. But this requires an instance shutdown. What if we want to change the port number of a running AEM instance? What if it is an e-Commerce site and shutting down the server means the loss of customers which implies the loss of business? This blog post will talk about how to change the port of a running AEM instance. In a production AEM environment, we access the AEM instance through a web server, typically Apache Web Server. Dispatcher module that sits on Apache communicates to the AEM server. An end-user is oblivious to the fact that an AEM server even exists? But if there is a vulnerability in your application which could be exploited through the port it is running on, then a potential hacker can take advantage of it and cause serious security problems by reaching the server through that port.It is always recommended that we should change the default port. Though, it is hidden that which port the AEM server is running on but what if a hacker gets that information? A production system needs to change the port in that case. Changing the port in the usual way requires downtime. And Downtime can have serious impacts. With AEM 6 onwards, we can change the port of a running AEM instance. Go to Felix Console and search for Apache Felix Jetty Based Http Service. 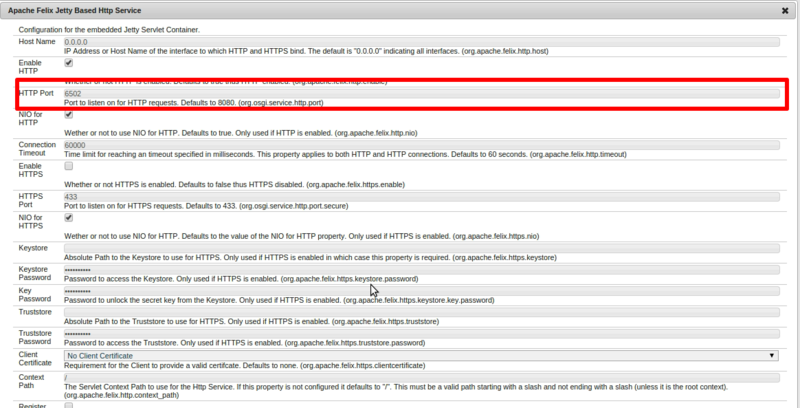 Change the default value of HTTP Port (highlighted above) with the new port number and hit Save. As soon as you save the configuration, the AEM will start running on the new port. To verify if the configuration works, reload the page. It will not open up. Now, open the same page with the new port specified in the above configuration. You will see that the AEM is running on the new port.